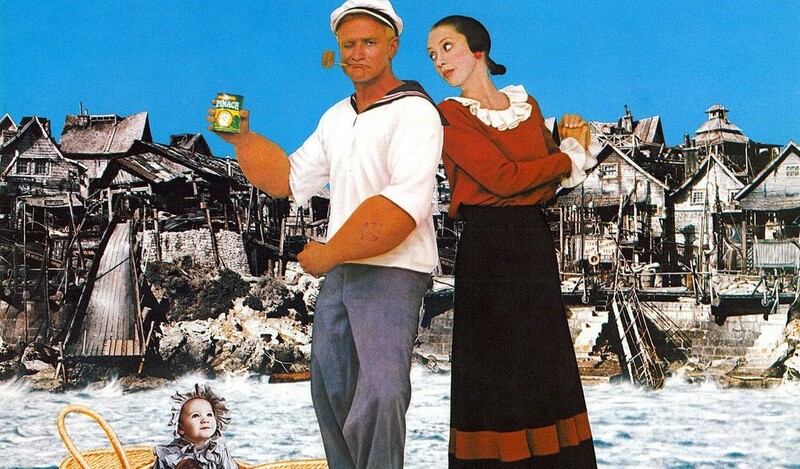 Popeye (film) The cartoon character comes to life in this joint Disney/Paramount musical fantasy. Popeye blows into Sweethaven on the heels of a story. He is looking for his long-lost dad but ends up mopping up various town bullies, falling for Olive Oyl, adopting an abandoned baby, and fighting an undersea battle with Bluto and a giant octopus. Original theatrical release by Paramount in December 1980. Directed by Robert Altman. Music by Harry Nilsson. Stars Robin Williams (Popeye), Shelley Duvall (Olive Oyl), Ray Walston (Pappy), Paul Dooley (Wimpy). Filmed on location in Malta, where the coast of Anchor Bay was transformed into the make-believe harbortown of Sweethaven. 16mm release by Disney on September 15, 1981.